Captures information about which windows you are spending your time in, to assist with personal scheduling and preparing timesheets. end of work day scripting allows actions to be taken once the total time booked exceeds a limit. 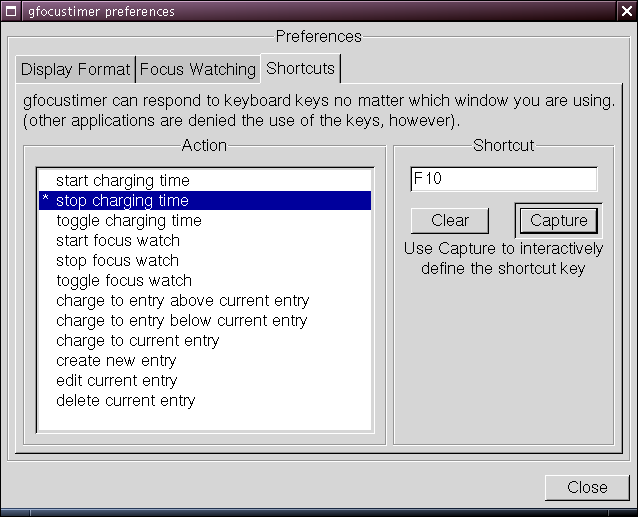 recognition of Enter key on task entry window. 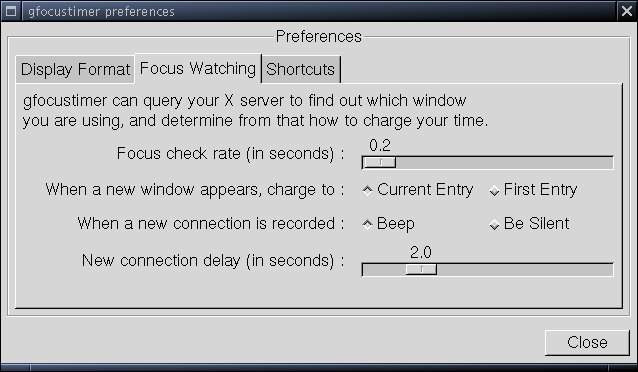 sawfish-raise.txt a way to have the Sawfish window manager raise the gfocustimer window periodically, contributed by Neal McBurnett. Displays limited information about the program and the GPL license brief text. 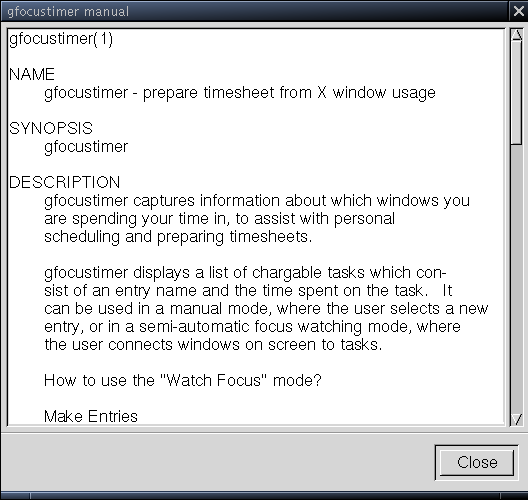 Displays the manual page built into the program. This is the window that you have on your screen most of the time. This particular shot of the window is in idle mode, not charging time to any entry. 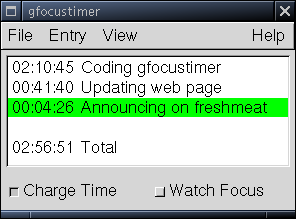 When time is being charged, a green highlight covers the entry, and the left column increments regularly. 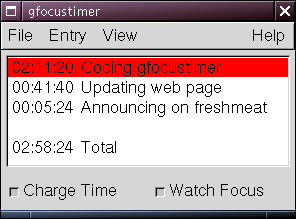 When you have chosen to use Watch Focus mode, and you have selected an entry but have yet to select the window to connect to it, the entry is displayed in red. It reverts to green once the other window has been given focus. Creating or editing entries uses this trivial window. However, since you may want to edit the time charged while charging time the change you make to the entry will include the time charged while making the change. 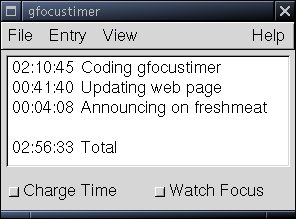 This is the event log view of the same data, showing the start time, duration, and task name. 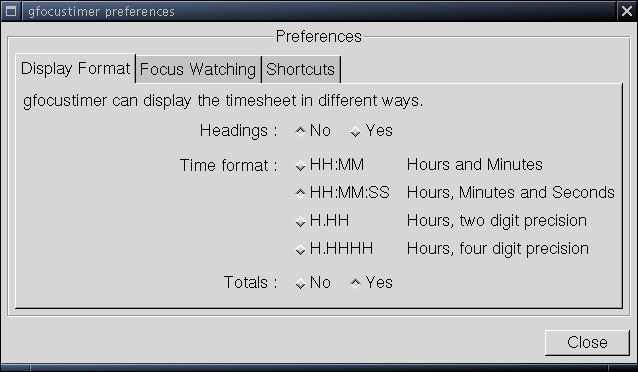 For events relating to the watch focus mode, the window title is recorded in the Details column. The Reassign button can be used to adjust an event so that it is charged to a different task. The Remove button can be used to remove an event, and thereby decrement the task total time by the duration of the event. The place where you may define a shortcut for gfocustimer operations. Users of Window Maker will recognise the layout here. see also README, TODO and NEWS in source kit. 2006-06-02 Add darcs repository, which has some changes over 1.0, go look. 2001-11-26 Release 1.0, update all screenshots, remove static build for 0.5, remove patch for 0.5, remove non-working RPM distribution. 2001-11-25 Rikke D . Giles writes to me to let me know that the .src.rpm file doesn't work on Mandrake Linux. His return mail address doesn't work either, so I can't thank him.